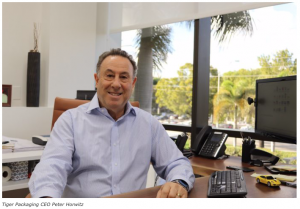 Peter Horwitz was rather quietly building his Tiger Packaging company when the Plastic Straw Convulsion hit late last year: American consumers rather suddenly were rejecting the idea of plastic straws to sip their Cokes because they were ending up as ocean waste, and plastic straws are a staple provision of Horwitz’s Boca Raton, Florida-based foodservice-supply company. But Tiger Packaging took the image hit to plastic straws in stride, and Horwitz has continued to promote the availability of more eco-friendly alternatives to full-plastic straws and other forms of packaging. In the meantime, the rapid turn of events has given him new appreciation for how significantly – and abruptly – the changing tides of public opinion can disrupt an entire industry. “Fast forward to last year, and suddenly we had much larger consumer awareness, and this thing just exploded,” Horwitz recalled. Paper-straw makers began to drop prices as they scaled up to meet demand – but then booming demand outstripped their capacity. All the players, including Tiger Packaging, have been scrambling to stabilize the supply chain.